Water shouldn't be an issue when you live in a fishing paradise. However, we've never been able to persuade the Upsalanians to only have structural fires next to one of our many lakes and creeks, so we have to do what's called a tanker shuttle. Actually, that's what you call it with multiple tankers. We call it "haul with our one and only tanker like water is going extinct." The nearest back-up tanker is an hour away, so there isn't a lot of point calling for help. My rule of thumb is that if we can't knock the fire down with the water contained in the pumper and tanker, the building is burning to the ground. In hydrant-less hamlets like Upsala, water is especially problematic this time of year. If the tanker guy has to shovel a path from the road, then scrape a foot of snow away so he can claw through a couple feet of ice before he can even connect a suction, the guys at the fire are bound to be left hanging for a long time. Not good. So I use what I call the Upsala Hydrant. 'Upsala Hydrant' is really a misnomer, because it didn't originate in Upsala, and it isn't a hydrant, but I call it that anyway because it sounds cool. It's a plywood tube, lined with blue styrofoam, and a styrofoam lined plywood lid on top. You chop a hole in the ice, stuff the tube in the hole, wedge snow and slush around it to freeze it in place, then put the lid on and bury it in snow. Voila! You have an Upsala hydrant. Here is what it looks like installed. The water looks dark because I installed this one by a culvert in a swampy creek. Fire doesn't care if you use smelly, murky swamp water to extinguish it. 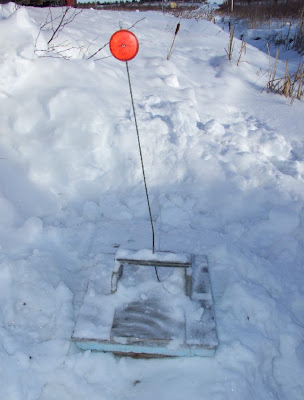 The reflector post helps us find it at 2:00 am after a blizzard. Here is the buried hydrant. (notice I didn't use quotes this time . . . I'm convincing myself that this really is a hydrant . . .). 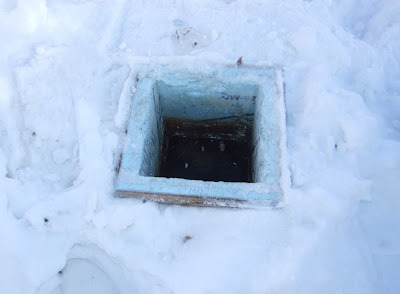 Once a week or so, you dig it up and break the skim of ice that forms on the water. 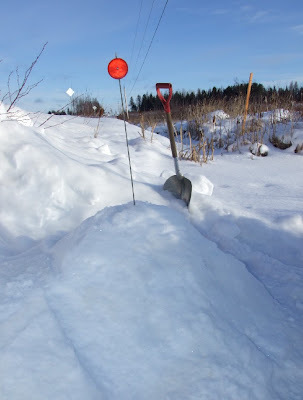 The temperatures ranged between -18 and -36 C (0 to -31 F) this past week, and when I dug this one up yesterday, I was able to break the ice with my shovel. An alternative to the Upsala Hydrant, is the Modified Upsala Hydrant. I installed one of these yesterday too. You chop a hole in the ice (and wish you had done this before the ice was 18" thick), lay a piece of plywood over the hole, and bury it in snow. It doesn't work quite as well, but still better than nothing at all. On a completely unrelated topic, Obama said the other day that his administration didn't realize until now that Al Qaeda in Yemen is interested in attacking America. I thought it was a no-brainer that every Islamic radical is interested in attacking America . . . and any country that isn't radically Islamic. I can be forgiven for my ignorance though. I live in Canada, and I don't have a global intelligence network feeding me information. On yet another unrelated topic, a guy in Barrie, Ontario was ticketed because he was driving while intoxicated. That isn't completely unusual, except that he was driving a snowblower. I guess it is more dangerous than driving an armchair under the influence. You can see my posts on that unrelated topic here and here.